After the optimism over progress in ceasefire talks last week, intense fighting has flared-up over the last two days. On Sunday night an Israeli Special Forces operation deep inside the Gaza Strip seems to have gone wrong, leading to a firefight in which a senior officer from the Israel Defence Force (IDF) was killed, as were seven Palestinian terrorists. The IDF said that it was not an assassination raid but an intelligence-gathering mission. Due to the firefight that broke out, the Israeli team had to call in support from tanks and aircraft in order to return to their own side of the border. That prompted an initial response from Palestinian terrorist groups, who launched at least 17 rockets and mortar shells at southern Israel. Three were intercepted by the Iron Dome air defences and the rest fell in fields outside of Israeli communities. There was a short period of calm after that. 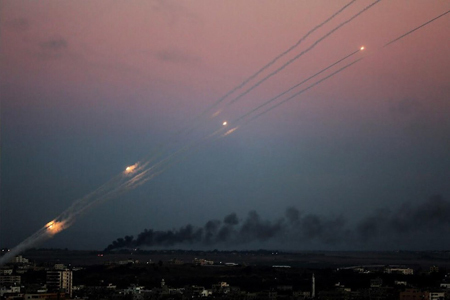 But then on Monday evening a barrage of more than 300 missiles was unleashed at Israel. As a result of that barrage, an Israeli soldier was seriously wounded when a bus which had been carrying troops was hit by an anti-tank missile. And although the Iron Dome system destroyed as many as 100 of the terrorists’ missiles, a number of civilians were wounded. One rocket hit an apartment building in Ashkelon, killing one civilian and seriously wounding another. In response, Israel carried out waves of air strikes against the Hamas and Islamic Jihad terrorist groups across the Gaza Strip, hitting as many as 150 targets. Then on Tuesday morning the IDF said that there had been a new barrage, including 70 rockets fired at Israeli towns since midnight. So this is now being described as the largest ever barrage on southern Israel. International condemnation of that missile barrage has come swiftly, with the United States, European Union (EU), Russia, Germany, Austria and France all joining in and calling for restraint. However, it seems unlikely that the Israelis will maintain their previous restraint after such a large barrage was fired at civilian communities. The world waits to see what they will do next.